Please note that ALL the arties will have ALL the installed unlockable modules removed, effectively becoming stock. The unlocked modules will be moved to your depot. Ammunition and equipment will also be removed from the arties and moved to the depot. Components, that will get removed from the game (for example tier 10 arty second suspensions) will be sold for their purchase price. Old-time FTR readers should know how this works, but, if you’re just joining us, here’s how this works. You send questions to tankarchives@gmail.com, and I will periodically answer them. My area of expertise is tank battles on Eastern Front and Soviet tanks, so keep your questions in that general area. Q: Why does the BL-9 in-game have a muzzle brake? Is it a real gun? A: The recoil generated by shooting a 25 kilogram shell at 1000 meters per second is considerable, and if you didn’t have a muzzle brake, the recoil mechanisms would have to be huge, and it wouldn’t fit into a tank. The BL-9 on the ISU-122BM doesn’t have a muzzle brake, since it has more room to recoil in, similar to how the A-19 fit into the ISU-122 without a muzzle brake. The BL-9 is a real gun. 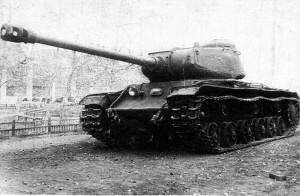 The tank version of the gun is also a real, but slightly different gun (the TD version was the OBM-50, the tank version was the OBM-51), with the same characteristics. Q: Are the IS-8 and Object 268 sized correctly in-game? A: In relation to each other? Yes. The hulls are different sizes in real life. Q: Is the ST-II (twin-gun ST-I) real? What tier would it fit best at? As for the tier, it’s an interesting question. The tank was built with a very high ROF in mind, 15 RPM, from the D-30 or D-10 gun. These guns have horrible penetration in game. It could be a tier 8 (since it would be a faster firing, more accurate IS-6), but I can’t see it doing too well at higher tiers without some kind of penetration buff. Seeing as how the current ST-I is languishing at tier 9 with a fictional gun that robbed it of all of its advantages, the ST-II’s fate will probably be all around poor, unless that part of the tree is significantly rebalanced. Q: Do you think the IS-4 should be renamed to the IS-4M? A: It would be a more correct name, but the elited version doesn’t fully represent the IS-4M, so it doesn’t really matter. Q: Was the Object 263 an SPG? A: Not much information is available on it, but, seeing as how many Soviet TDs were equipped with artillery sights, it is possible that it could be used in an SPG role. Q: I noticed that the IS holds less than 30 122 mm shells, and the KV-1 can hold 50. Are howitzer shells smaller? A: Not all shells of the same caliber are the same length. A howitzer shell often holds less propellant than an equivalent caliber gun shell, and, as a result, does not need to be as long. Q: Did the KV-1S have the D-25T historically? A: Historically, the KV-1S was able to mount the IS turret as a modernization measure, before enough ISes could be built. I think only one KV with a D-25T was actually built, though. A high powered 122 mm gun was also developed for it (almost as good as a BL-9), so if the D-25T isn’t historical enough, I’m sure the developers can bump it up a little.